Gastronomy, Gardens and a Floating Hotel! Renowned for its foodie culture yet still relatively under the radar as a European short break destination, Rotterdam’s a great choice for an Easter break. Enjoy a five-night stay on board the ss Rotterdam (former flagship of the HollandAmerica line, now a four-star hotel) as well a ‘Bike & Bite’ tour of the city (combining cycling with delicious snack stops), a ‘Super Combo’ tour with the world-famous Keukenhof Gardens and Euromast Tower, plus a cruise of Spido Harbour amongst its highlights, and a day trip to Amsterdam. Departing 18 April, the price from £855 pp (two sharing), including direct Eurostar from London, B&B and excursions. For railway connoisseurs, there can be few experiences more alluring than the chance to enjoy sights not normally seen by the average passenger. This two-week, ‘access all areas’ itinerary takes in many of North Wales’ spectacular railways, from miniature to standard gauge, with footplate rides, workshop tours, expert talks and more. Departing 30 March, Behind the Scenes in North Wales costs from £2,610 pp (two sharing), including B&B (in Llandudno, Caernarfon, Porthmadog, Machynlleth & Llangollen), seven lunches, 11 evening meals, excursions and the services of a tour leader. Whilst spring may be a way off yet, now’s the perfect time to start planning a delightful holiday for warmer days. Following the route of the mighty Elbe through Germany and the Czech Republic by rail and river, this escorted tour is certainly something to look forward to. Enjoy time exploring Hamburg, Prague, Magdeburg & Dresden, as well as excursions to narrow gauge steam railways, a cruise by paddle steamer and more. Departing 16 May, Elbe - Sea to Source costs from £2,270 pp (two sharing), including travel between your home station and London, rail out/flight back, 15-Day Global InterRail Pass, B&B, excursions & tour leader. Inspired by Michael Portillo’s latest BBC2 travelogue to explore the USA’s ‘Last Frontier’ by train for yourself? 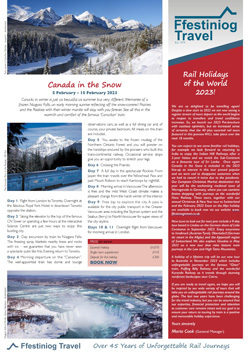 Rail holiday specialist Ffestiniog Travel has created a tailor-made tour that follows in the presenter’s tracks, covering the entire Alaska Railroad and taking in famous attractions such as Denali and Kenai Fjords National Parks. This 15-day Alaskan odyssey costs from £10,660 pp (two sharing), including flights (to Seattle/from Anchorage), B&B, two lunches and two dinners, plus rail travel, private transfers and excursions as per the itinerary.